Measuring employee engagement is not new to the HR community. Many organizations, consultants and tools make a living by measuring this critical metric. This process can take from 30 to 90 days in a full cycle, depending on a number of factors. Some newer methodologies focus on daily, weekly, or monthly simple surveys called “pulse feedback” to consistently capture engagement feedback. Pulse surveys require either sophisticated tools or a lot of attention to ensure data collection, results review, and action planning is a regular practice. And of course employee engagement serves another purpose: a mechanism for employees to share feedback! We ran with this traditional approach at Spreetail for a couple of years. We used questions that were tried and true measurements of engagement, and some that really spoke to Spreetail’s culture. We were moving fast and growing quickly, so we did the survey twice a year to keep a pulse on our team. We would get impressive response rates, always upper 90 percent. Every team would have strengths and opportunities to work on. We would share the results across the entire company. We would have People & Culture reps work on action plans with the organization. And yet we felt like something was missing. We felt like we were getting the same non-specific outcomes and changes. We felt stalled. And in an environment like Spreetail where everything is else is moving at lightning speed, it just didn’t fit. For Spreetail, it isn’t about the scores or benchmarking our results. A core value of how we operate is giving and receiving feedback — our humility. It’s not just about receiving feedback, but putting action behind it. After all, our best asset as a growing business is improvement, and we place a high value on that. If every individual can get better, and every team can get better, then Spreetail as a whole will be better. With these things in mind, we set out to discover and build the right solution to measure how Spreetailers connect with our organization. I won’t go through all the rabbit holes of Google, but let’s just say it was fun! Our research led us to two standout principles that we combined to create our own Team Health Checks. During Team Health Checks, each Spreetailer chooses a stoplight color reflecting their rating on each team dynamic. The employee then shares a brief reason they selected this color with the group. The first main principle is Spotify’s methodology for Squad Health Checks as a way to understand how their team is doing. It‘s a simple process: Anyone involved in a “work effort” completes a Squad Health Check at the end of the “effort.” This requires each individual in the work group to provide feedback on structured topics such as teamwork, speed, and fun via a red, yellow, or green card. The data is summed by each topic, and the group learns what they can do differently in the future. And so, we combined the Spotify process with Google’s research on effective teams to create our own Team Health Checks. We started by defining what red, yellow, and green each mean for the dynamics above. Then, each team meets as a group, and a facilitator takes them through a quick red/yellow/green feedback session on each dynamic. Each team member also shares a sentence to describe why they are providing that rating. For a team of about 20 people, this whole process takes around 30 minutes. Then, based on the feedback, the team identifies an area to improve and one or two action steps to drive that improvement. This approach is hyper-local, meaning team members who work together are in the room. This approach is also in the moment. The feedback is provided, summarized, and action is determined all in an hour. And this approach opens the feedback for group transparency. Trained facilitators like Steph Buck, Leadership Development Program Lead, walk each team through the Team Health Check feedback session, and guides the team in selecting action items. Of course, a drawback many may see is scalability. As our 500-person organization grows, how do we continue this hyper-local approach? The answer, for us, is to place the same importance on these Team Health Checks as we do on a financial meeting. If we are willing to figure out how to ensure financial meetings can grow, evolve, and add new individual or business units, then we better also be able to figure out how our team can best be connected to where we are going. Our evolution through effective employee engagement tools has led us to a solution that aligns with not only our purpose for feedback and action, but also our pace and growth. The key, we found, was to let our team’s unique challenges and our company’s core values drive our process. 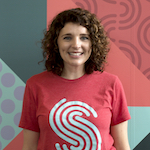 Emily Olinger leads Spreetail’s People and Culture team. Her experience spans private, public, and startup organizations, including leadership roles in revenue impacting, operations, and product experience teams. These past experiences have helped Emily shape her focus on growing and developing an organization through its most important asset: its people.